The Bahia Aventuras I is a 2008 boat design complimented with a 2008 Suzuki 250HP that allows for comfort and style when navigating. It has 14 individual seats and accomadates any of our tours; a 4 person Private Sportfishing Tour to a 14-passenger Bahia Aventuras Combo Tour. communication. ! Fishing equipment: Complete Shimano Fishing Equipment with Penn reels ! Snorkel gear: 20 sets of Speedo Snorkelling Equipment. 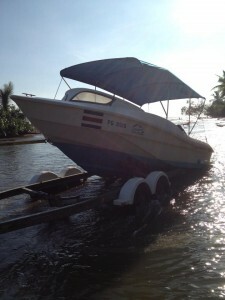 Bahia Aventuras I is a 26 feet boat complimented with a Suzuki 300HP that allows for comfort and style when navigating. 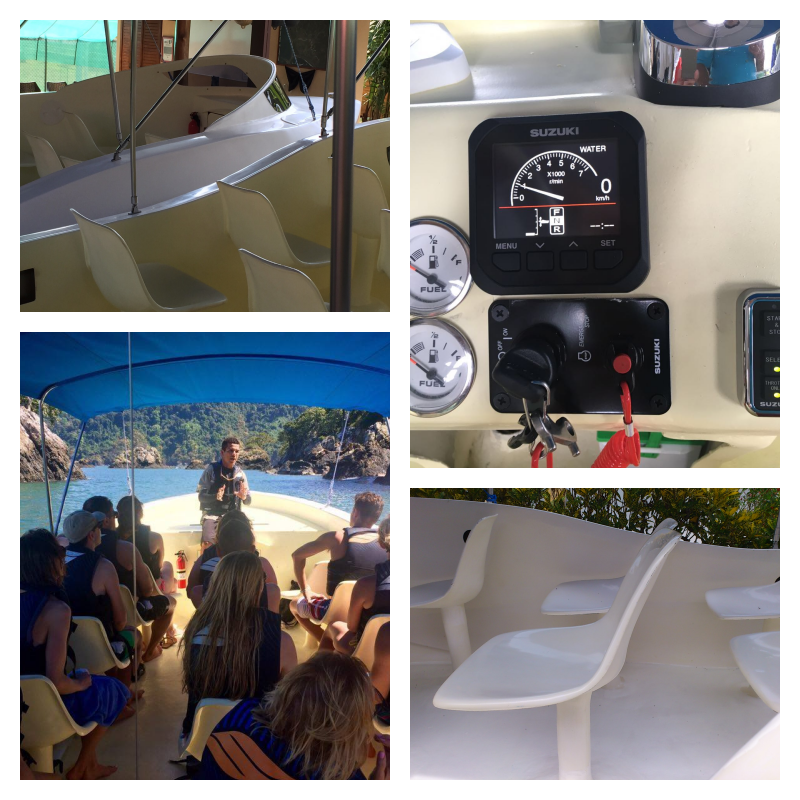 It has 14 individual seats and accommodates any of our tours; a trip to Cano Island for some great snorkeling or Whale Watching & Dolphin Encounters. Sun-protective awning to accommodate tour needs. Motor: Suzuki, four strokes, fuel injected, 300 HP, with hydraulic direction. Navigation equipment: Garmin GPS MAP 400 series-sound, fish finder and long reach radio communication. Snorkel gear: 20 sets of Snorkeling Equipment. Bahia Aventuras II is a 22 feet boat design with a 2014 Suzuki 175HP that allows swift navigation and comfort. 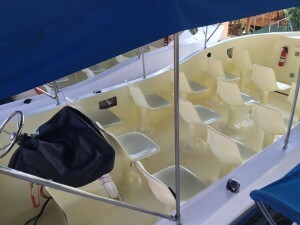 The boat is crafted for 11 individual seats with maximum capacity of 11-passengers. 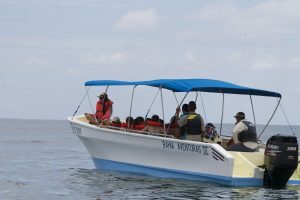 Bahia Aventuras II has the ability to accommodate any of our tours; Corcovado National Park day tour or a voyage through the Terraba Sierpe Mangroves. Maximum Capacity: 11 Passengers with individual seats. Motor: Suzuki, four strokes, fuel injected, 200 HP, with hydraulic direction. 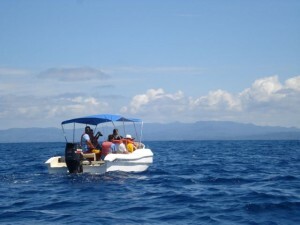 Bahia Aventuras III is a boat made for larger groups. It is spacious and holds comfortably 18 passengers with individual-row seating. 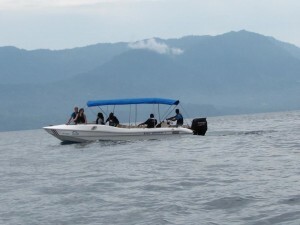 The boat is perfe ct for trips to Corcovado National Park, Cano Island and can be reserved for your private journey. Maximum Capacity: 18 Passengers with individual seats.